One of the big benefits of running is that there’s not much kit involved. Shoes are obviously the biggie, but once you’ve got those sorted the rest is really just about clothes to match the seasons and maybe a hydration pack once the miles crank up. Same goes for open water swimming: cozzie, cap, goggles, and you’re good to go. Maybe a wetsuit and some neoprene bits for winter, but that really is pretty much it. Stand-up paddleboarding? Er, not so much. OK, I admit this is an own goal: by choosing my gorgeous Starboard Race over an inflatable board, I knew I was making my life a bit more difficult. And expensive. Why? Because to transport the Race from A to B on my own I’ve had to invest in a roof rack, something I’ve never needed before and frankly don’t need for anything else. 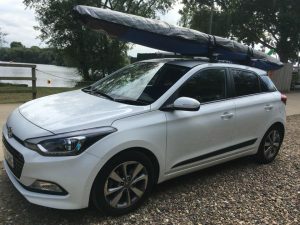 But it’s done, and on Friday 8 June, I got a newbie’s lesson in loading a board correctly from Andy at Bray Lake and set off for an Airbnb in Stamford ahead of the next in the GB SUP National series, a race across Rutland Water the following day. The last time I was there, I was swimming in the reservoir on the first leg of the Vitruvian Half Ironman so it was especially rewarding to look out at this not insubstantial chunk of water and note that I would soon be able to say I’d not only competed in it but on it. And the race? Brilliant — loved it, even though I was last in my race class (though by no means overall) and it was nearer 11k than the advertised 10. 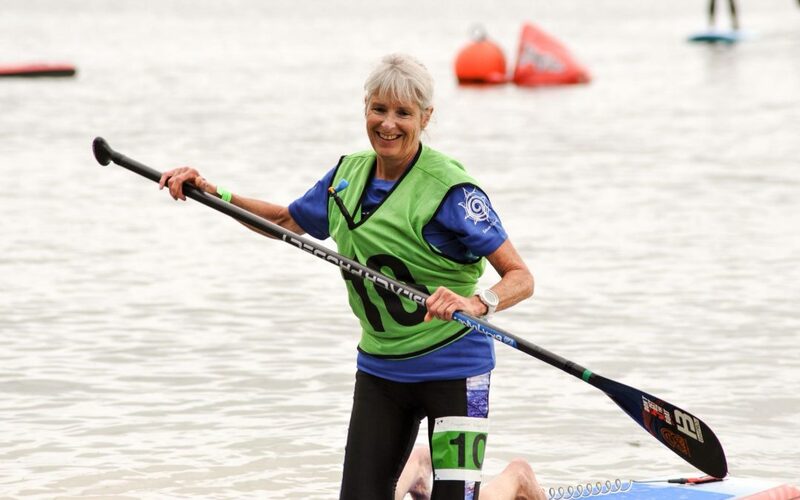 A smaller field than at Cardiff and I was simply out-paddled — especially by my awesome 60s+ role model Susan, who got away from me at the start and stayed away despite my best endeavours! My average speed was a little slower than at Cardiff, but I had no current to assist here. 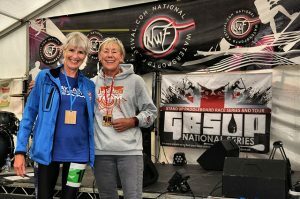 And I still picked up some bling for second Grand Kahuna — Susan and I now have those positions for the series, as there are only two more races to go and we can’t be caught. Yay! Lessons learned this time? I need to spend more time in windy conditions: although there wasn’t a strong wind — indeed, only just enough for the windsurfers to get some decent momentum — it did challenge me in places. Working with a cross-wind is particularly hard, as to stay on course you have to do all the paddling on one side of the board and my left shoulder was screeching after around 2k of this! But enough of the racing. The high spot of my weekend was in fact meeting the totally awesome SUP adventurer and instructor Sian Sykes, who set off in March — remember March? When it was freezing and grey and wet day after day? 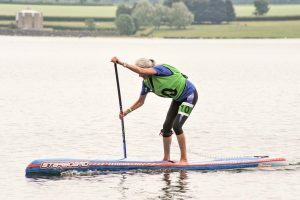 — to paddleboard around her native Wales and draw attention to the ubiquitous plastic pollution of our waterways and oceans. Her SUP Against SUP — stand-up paddleboarding against single-use plastics — mission took her two months, solo and unsupported, and sometimes she was spending up to 13 hours a day on the water. This was the first time anyone had circumnavigated Wales by SUP, and it was an extraordinary feat. Sian travelled plastic-free throughout, and collected bottles and other single-use rubbish as she went along, creating a ripple effect of awareness everywhere she stopped. ‘Everybody I’ve met has pledged to make a positive change,’ she said. I have total respect for Sian — total — and for Cal Major who is currently paddle boarding from Land’s End to John O’Groats, also to raise awareness around our profligate use of single-use plastics and their impact on our environment. In fact, I’m in complete awe of both of them! Why, I wondered, is it the women who are taking on these tough SUP challenges to shift our group consciousness? Thanks, Susan — such a fun day 🙂 Bring on BaySUP! Wow Sian and Cal are super women indeed!! For a cause which has definitely hit home with me, especially living on the water the way I do. I spend everyday picking up litter/plastic on the canal side, because otherwise it would end up in the canal, then rivers, then the sea, in fact wherever I walk now I litter pick. I just find it difficult to walk past. Such an amazing thing for both of them to do! I’m in awe too! They are both extraordinary, Sam. Hi Eugenie, I just “met” you on Sam’s blog and just signed up to be a regular reader. I can sympathize with the loading of the SUP and all the strings attached. My paddleboard spends all summer at the campground in the Sacramento (CAlifornia) River Delta, where we keep our RV and all things watersports (windsurf gear, SUPs, kayak). I just added an inexpensive mountain bike to the pile for those non windy days. I could do a better job with plastics, but I use my re-usable water bottles for everything (even coffee)! Looking forward to reading more!